Maryland Lyric Opera’s next Young Artist Institute Concert will be held in Bethesda, MD on Friday April 20. The seven young artists who will sing popular arias at this performance competed against hundreds of applicants for the MDLO training slots. All of them have college degrees and graduate degrees or graduate level training and all have sung in operas already, most professionally. Why do they seek additional training at this point? It set me to thinking. 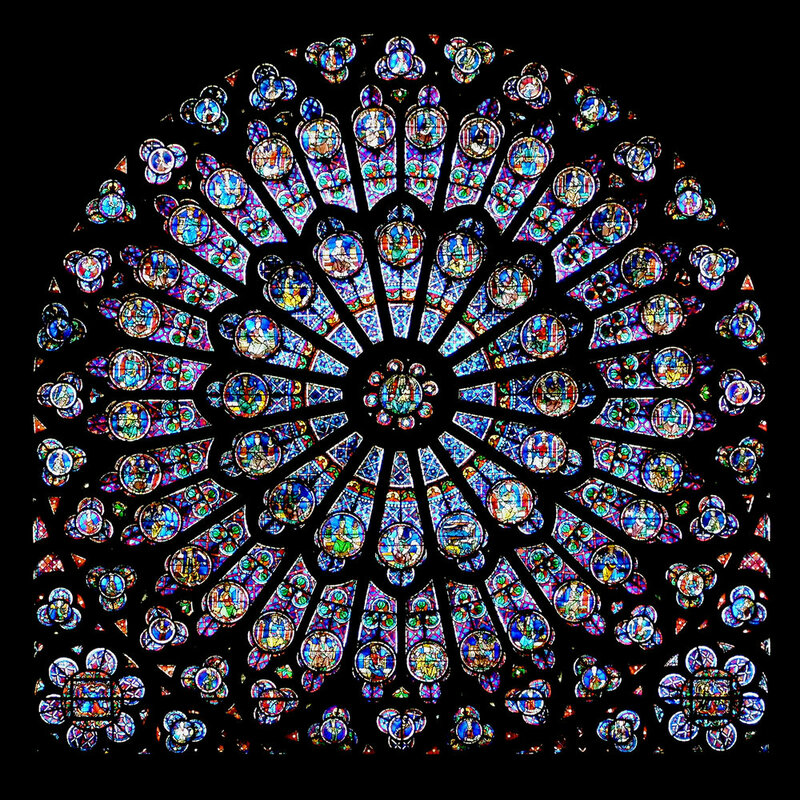 "Rayonnant rose window in Notre Dame de Paris. In Gothic architecture, light was considered the most beautiful revelation of God", says Wikipedia's caption. I might contend that the human voice can be even more effective at revealing beauty than a stained glass window. Photo from Wikipedia commons. What is it that young artists training programs for emerging opera singers do? Yes, they provide young singers with voice lessons and performance lessons and build resumes and networks for seeking performance opportunities, but what is it that opera singers are really trying to do? Yes, they want to master their craft and this training provides a step up, but what is it that they are really trying to accomplish, the end result? Perhaps a sense of satisfaction and personal fulfillment from their accomplishments? When I wax philosophical, I find it is not straightforward statements of truths that help, but rather stories or vignettes. To get at my question, I’d like to relate a few vignettes including a couple of chance encounters with transcendence. Vignette one: In the 1994 movie, “Shawshank Redemption”, a scene occurs (above video from YouTube) where inmate Andy (Tim Robbins) is cleaning the prison warden’s office and chooses to play a record over the prison sound system. The recording is a duet from The Marriage of Figaro. The camera pans the prison and everywhere prisoners stop and listen to the music, entranced. As the guards break down the door to the office, inmate Red played by Morgan Freeman is heard in voice-over saying, “I have no idea to this day what those two Italian ladies were singing about. Truth is I don’t want to know; some things are better left unsaid. I would like to think it’s something so beautiful it cannot be expressed in words and makes your heart ache because of it.” Beauty has the power to entrance because it speaks directly to our hearts, just like stained glass windows. Vignette Two: Once when I was a young teen looking for something to watch on television, I landed on a channel that had an image of a guitar resting against a stool in the middle of an empty stage. This seemed to promise music, so I remained stationary for a moment. The camera panned stage left to a man walking with assistance towards the stool, a very old, white-haired man dressed in a tuxedo. I was impressed by the tuxedo but felt sorry for him needing assistance and was intrigued that he was headed for the guitar. He sat down and took the guitar that was handed to him. Then, he began to play what I remember as some of the most beautiful music I had ever heard. I sat in rapture. When he finished, I no longer found the man to be pitiable but instead felt that he had become beautiful, had transcended time and forged a connection between us; I had glimpsed the soul of the man, and maybe my own. I think he was a famous classical guitarist of the time, though I never learned his name (no Google in those days). The details of that moment have gotten hazy over the years, but I have never forgotten that moment and I never will; it changed me. Beauty is transformative. Vignette Three: Back in February, I was invited by Matthew Woorman, general manager of the Maryland Lyric Opera, to attend a rehearsal of their February young artist concert. I find the opportunity to hear opera sung up close and personal to be practically irresistible, so of course, I said yes. I sat down not far from the stage in a modest-sized theater in Bethesda to observe the proceedings. Something occurred that took me back to that teen age experience so long ago. Each of the young artists walked onto the stage to rehearse their arias with only piano accompaniment. Each was attractive and attired in casual dress, but not otherwise remarkable, the sort of people you might run into in your local mall. However, when they started to sing, they, the auditorium, and I were transformed; the contrast between how they seemed and what they became when they began to sing opera was stunning. I only expected to be entertained by some good music and learn more about opera, but somehow my spirit felt lifted, or like the men in the prison yard, freed for just a moment. Beauty exalts. left to right: Nayoung Ban, Sarah Costa, and Nina Duan. Photos courtesy of Maryland Lyric Opera. Maryland Lyric Opera is a small opera company with an ambitious agenda. It’s founder and president is collaborative pianist and opera/chamber music administrator Brad Clark. This season MDLO added as music director, conductor Louis Salemno; head of voice training, baritone William Stone, and associate conductor Rafael Andrade. MLDO is committed to education and training in opera singing with the goal of ensuring “that the next generation of singers are exposed to and have the opportunity to learn from experienced professionals who have spent years studying and improving their craft on the world’s stages.” It has produced staged operas in its past short history and announced plans last October to return to that effort in the near future; according to Mr. Woorman, the plan is to use their Institute as a pipeline to involve new talent in these productions. They also operate a Sharing Music, Sharing Love series that performs short opera programs for underserved populations. There is one more scheduled training session for this season, which will begin in June. left to right: SeungHyeon Baek, Joseph Michael Brent, Yongxi Chen, and Chunlai Shang. Photos courtesy of Maryland Lyric Opera. Today, they are focused on training the current members of its Young Artists Concert Institute: baritone SeungHyeon Baek; soprano Nayoung Ban; tenor Joseph Michael Brent; tenor Yongxi Chen; soprano Sarah Costa; mezzo-soprano Nina Duan; and, baritone Chunlai Shang. MLDO is considering talent world-wide. This session includes three singers who received appointments after auditioning in China: Mr. Chen, Ms. Duan, and Mr. Shang. By Friday, these already accomplished young opera singers will have received approximately a month of intensive one-on-one professional level training in opera performance and singing on a daily basis from the experienced staff of Maryland Lyric Opera. They will have previously excelled in singing somewhere, maybe in a chorus or choir when someone noticed they had promise and mentored them toward this path. I believe that they will have received this attention and training and mentoring because their teachers and mentors are also inspired by beauty; their hearts are in this work. And at MLDO, they will have received this training at no charge because there are friends and donors to MLDO that are also inspired by beauty. So on Friday, seven young singers will take the stage in the next step on their journey to beauty. When you see these young artists on recital night, they will be dressed appropriately, and beauty will not emerge as a surprise. However, consider this: these young kids (kids to me) do not become beautiful in their singing; they are already beautiful. I think that they, like my elderly guitarist of years ago, are capable of becoming beauty itself. I believe that that is what opera singers are really trying to accomplish. It is entertainment, but more than that, it is art. Opera at its best is art, and it not only entertains us, but via its art, connects us to each other and inspires us to rise to our better selves. This is why so many artists are inspired to make it their life’s work. This is why opera endures, and it explains what these young artists are trying to do - struggling to become beauty itself, shaped and colored by who they are, just like the stained glass windows transmitting the light. Yes, you will be entertained Friday night, and just maybe, get a glimpse of beauty. Poster image courtesy of Maryland Lyric Opera. The Fan Experience: Free and open to the public, the young artist recital begins at 6:30 pm Friday, April 20, at the Bethesda United Methodist Church at 8300 Old Georgetown Road in Bethesda, MD. There are two parking lots adjacent to the church which sits at the corner of Huntington Parkway and Old Georgetown Road; the entrance to the sanctuary is near the intersection. After turning onto Huntington from Old Georgetown Road, the first right turn will take you to the parking lots. The Bethesda Metro Stop is slightly under a mile from the Church. The next Young Artists Institute Concert will be on June 22.